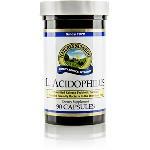 Acidophilus is a strain of Lactobacillus, a symbiotic, homo-fermentative, lactic acid-producing microorganism. Friendly bacteria help keep in check other microbes that produce toxins that may be absorbed into the bloodstream. As long as all of these different species work in harmony, dangerous types are kept in small enough numbers that they, too, are often beneficial! This illustrates one of nature’s ironies: what is harmful in one amount may actually be healthful in another amount.